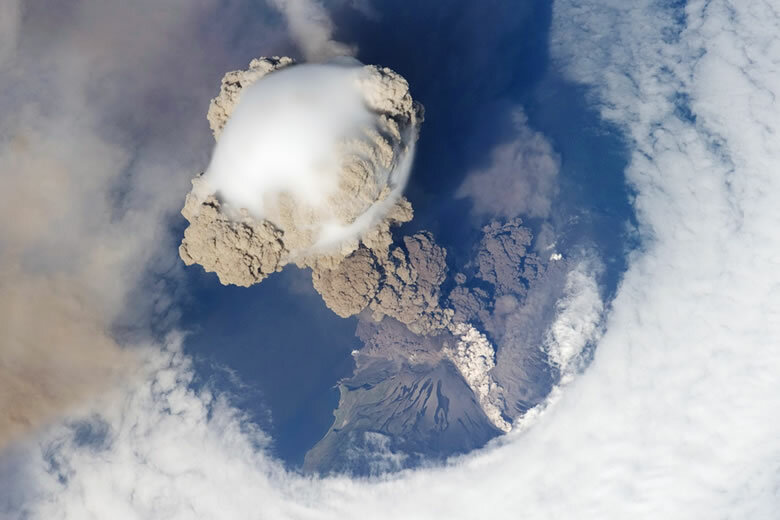 Sarychev Volcano: This image of Sarychev Volcano in the early moments of an eruption was captured with a hand-held camera by an astronaut on NASA's International Space Station on June 12, 2009. 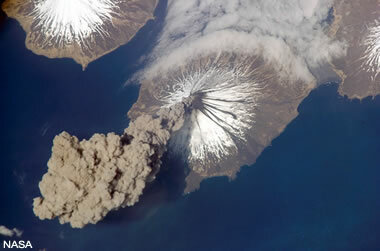 Sarychev is one of the most active volcanoes in the Kuril Islands of Japan. More information. Jupiter's moon Io is the most volcanically active body in the solar system. The black areas are deposits of recent volcanic activity. 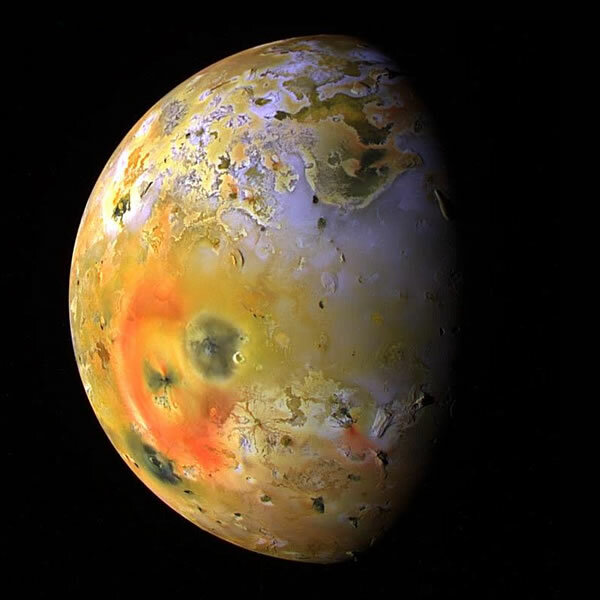 The yellow-brown color marks the sulfurous deposits that blanket most of Io. 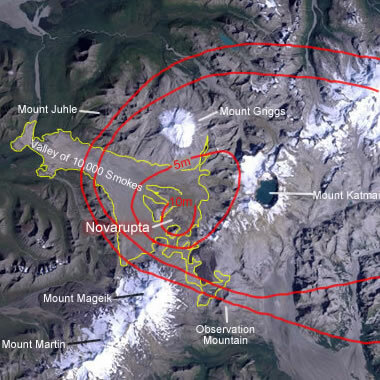 The red areas are covered by sulfurous deposits that are still warm from recent eruption. This image was compiled from data collected by the Galileo spacecraft in September, 1997 from a distance of 500,000 kilometers. Image by NASA. Enlarge. More information. 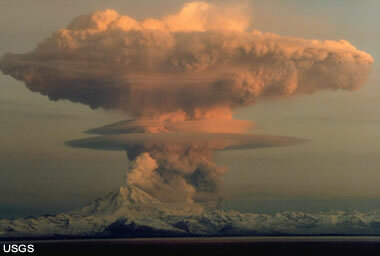 Eruption cloud from Redoubt Volcano as viewed from the Kenai Peninsula. 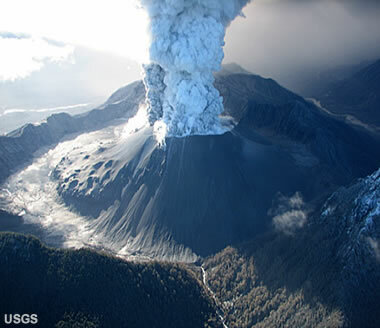 The mushroom-shaped plume rose from avalanches of hot debris (pyroclastic flows) that cascaded down the north flank of the volcano. A smaller, white steam plume rises from the summit crater. Photograph by R. Clucas, April 21, 1990. USGS image. Enlarge. More information. 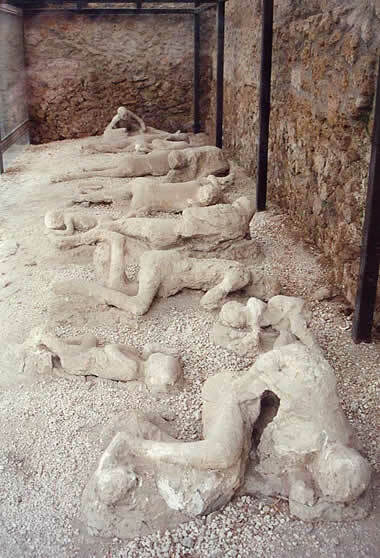 Plaster casts of people who died in the city of Pompeii during the 79 AD eruption of Mount Vesuvius. They were buried by the ashfall. Photo: Garden of the Fugitives, was taken by Lancevortex and is distributed under a GNU Free Documentation License. More information about Vesuvius. 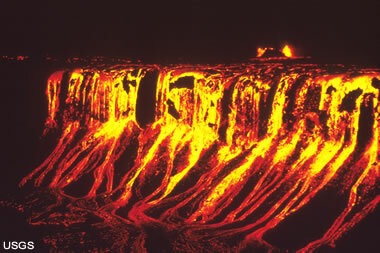 Night photo of lava from an eruption at Kilauea Volcano cascading into Aloi Crater in December, 1969. USGS photo. Enlarge. 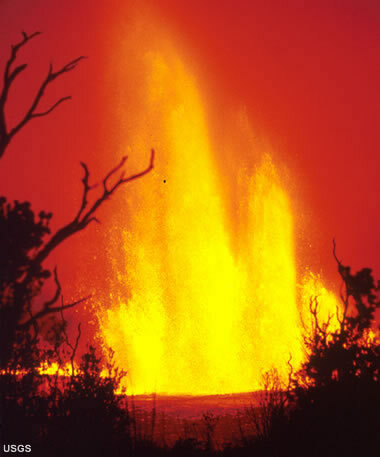 The 1969 eruption at Mauna Ulu, a vent of Kilauea Volcano in Hawaii, was a spectacular example of fire fountaining, also known as an Hawaiian Eruption. Photo by D.A. Swanson, USGS, August 22, 1969. USGS image. Enlarge. More information. 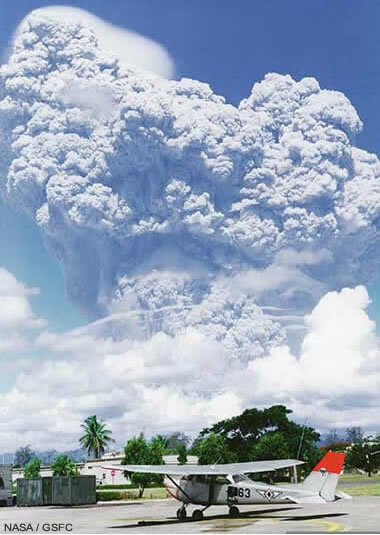 Mount Pinatubo erupted in the Philippines on June 15, 1991. 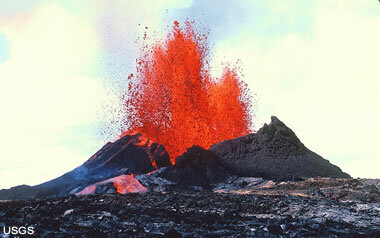 It was the second-largest volcanic eruption of the 20th Century. NASA/GSFC image. Enlarge. More information. View of an eruption column from Chaitén Volcano, Chile, photographed on May 26, 2008. The caldera is about 3 km (1.9 miles) in diameter from rim to rim. U.S. Geological Survey photograph by J.N. Marso. More information. 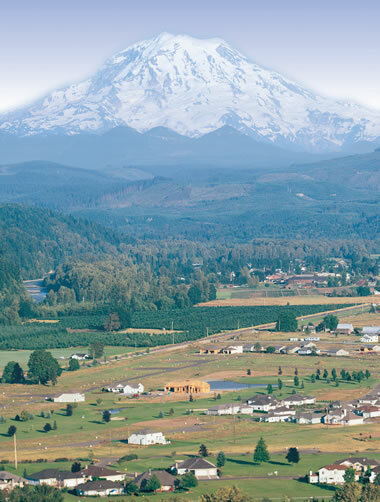 Mount Rainier has not erupted since 1895; however, it is still considered to be active and has the potential to erupt with devastating results. Image by USGS. More information. 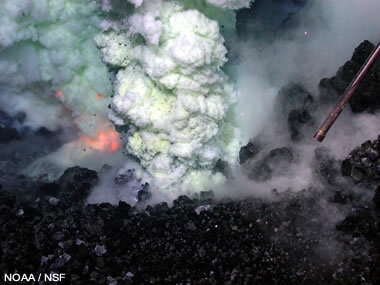 A tube of pillow lava extrudes from a flow underwater at the West Mata Volcano in the Western Pacific Ocean. Image by NOAA / NSF / WHOI. Enlarge. More information. 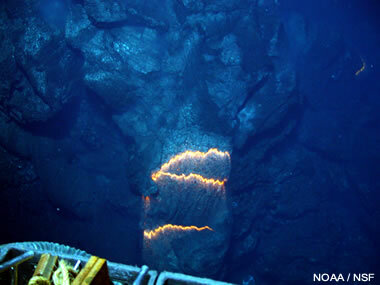 Underwater photograph of glowing lava, plumes of gas and escaping ash taken near the summit of West Mata Volcano in the Lau Basin of the Western Pacific Ocean during a 2009 eruption. Image by NOAA / NSF / WHOI. Enlarge. More information. 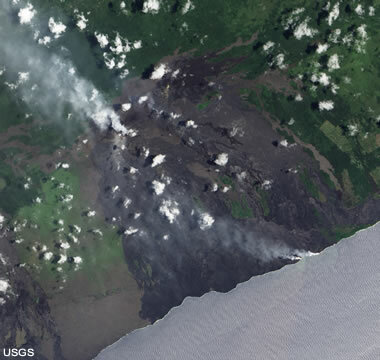 This satellite image shows the height of Eyjafjallajökull’s ash plume, superimposed with a natural-color view. 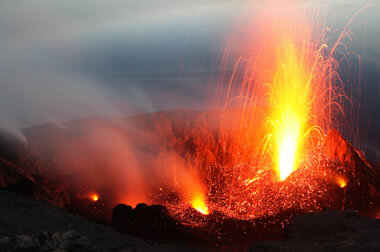 The volcano cost the airline industry about $3.3 billion in lost fares in April, 2010. Image by NASA. Enlarge. More information. The most powerful eruption of the 20th century was a case of mistaken identity. 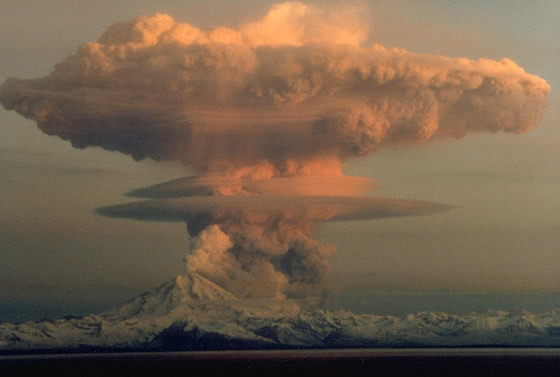 At first, the blast was blamed on Mount Katmai, but years later it was realized that the eruption really occurred at the site of Novarupta's volcanic dome. 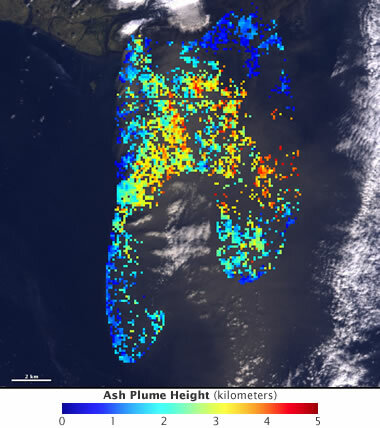 Areas in this image mark ash fall thicknesses (red) and the deposits of an extensive lahar (yellow). NASA satellite image annotated by Geology.com. Enlarge. More information. Basalt flows from an eruption at Pu'u O'o vent enter the Pacific Ocean on the island of Hawaii. NASA image. Enlarge. More information. Small eruption in the crater of Stromboli Volcano. Photo by Rainer Albiez @ iStockphoto. More information. 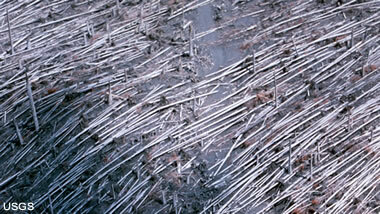 Downed trees litter the landscape after the eruption of Mount St. Helens in 1980. The lateral blast knocked down every tree within several miles on the north side of the mountain - enough trees to build an estimated 150,000 homes. USGS image. Enlarge. More information. Steam rising from a cinder cone in the crater of Mount Veniaminof, Alaska, (see rim in the distance) during a 1984 eruption. 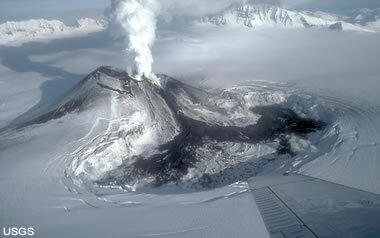 A lava flow melted a large depression in the ice cap. USGS photo by B. Yount. Enlarge. More information. 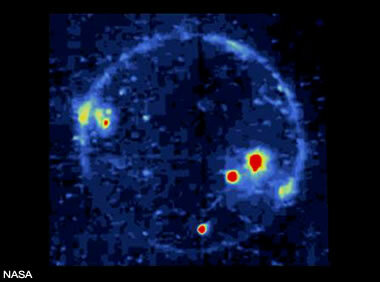 Heat map of volcanic activity on Jupiter's moon, Io, acquired by the Galileo spacecraft during an eclipse. Image by NASA. Enlarge. More information. Pu`u `O`o cone early in an eruption that would continue for over three decades - and continues today. Enlarge. More information. 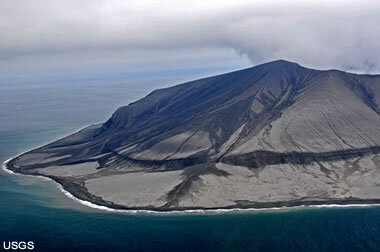 Mount Cleveland is one of the most active volcanoes in Alaska and a serious threat to air traffic. This eruption occurred on May 23, 2006 and was captured in this image by Jeff Williams, an astronaut on the International Space Station. Enlarge. More information. 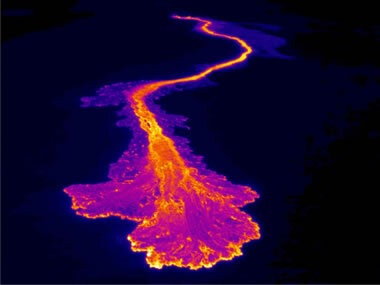 This is a thermal image of a channelized a'a flow that was being fed by the fountains at the west end of Kilauea's fissure system. Near the end of the flow, the channel empties into a delta-like flow front. USGS image. Enlarge. The southwest flank of Kasatochi volcano was blanketed with fine-grained pyroclastic debris after a pyroclastic surge and ash fall on August 22, 2008. Image by Chris Waythomas, USGS. Enlarge. More information.